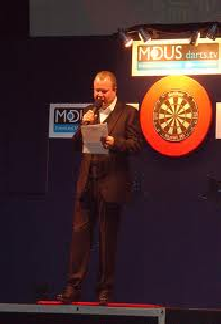 George has refereed major dart tournaments worldwide for over 20 years and has officiated 20 World Professional Championship Finals, and over 300 international TV events. George became the first referee in history to call 2 nine dart finishes live on T.V. in the same match. He has also been Master of Ceremonies in numerous televised events throughout Europe and has appeared on TV shows and films. He has appeared on television in over 100 countries for networks such as Sky Sports, BBC, ITV, SBS6, RTL5, Euro Sport, Sport1, NOS, DSF & ESPN. George can compliment any event adding his professional touch.